We're in the adolescent stages of the Obama Presidency. Could this be why we now cringe with embarassment when our one-time hero dresses like a frumpy dad? Whither the mandals chagrin? I am a little frumpy...Those jeans are comfortable, and for those of you who want your president to look great in his tight jeans, I'm sorry - I'm not the guy. It just doesn't fit me. I'm not 20. In light of falling numbers, domestic and foreign turmoil, still-visible oil - and, not incidentally, a visit to the View that was dad-embarrassment incarnate and made "dignity" a harder fallback - this is more challenging. 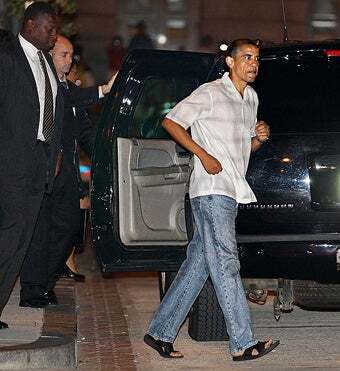 And people are coming down hard on the mandals Obama sported to the Spy Museum. Sure, they're ugly. Men's sandals have always been controversial. ("There needs to be sand beneath your feet, or your name needs to be Matthew McConaughey," says one critic.) And yet, it seems to be the frumpy, dowdy, dad clothes that mortify people - the sort of thing a dad would wear bird-watching. This, we seem to feel, is not what a President should wear. And yet, when you think about it, this is strange in itself; Obama, after all, is a dad, and a middle-aged man. A cynic could argue that a little deliberate frumpiness does a family-man president no ill, just as mentioning his daughter's braces is relatable — as would be said daughter's probably eye-roll. Less cynically, would be protest so much over the jeans and the sandals if we didn't secretly like them? It's not his critics piling on affectionately, after all. But people who loved him, are maybe a little disillusioned and want to believe again.